Arriving from South Korean side Gangwon High1 - Tyler Brickler. An ice hockey player is hot-footing it to Dundee - to avoid the unpredictable actions of US President Donald Trump. Tyler Brickler, who is of American-South Korean heritage, didn't like the way the wind was blowing, politically, when he played for South Korean side Gangwon High1. So after considering Trump's robust statements on the region, he opted for a move well away from the East Asia. 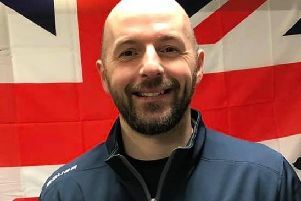 The 26-year-old has now signed for Scottish side Dundee Stars, coached by former Sheffield Steelers winger and assistant coach, Marc LeFebvre. “The experience in Asia was great and I got to see a lot of Seoul and South Korea as well as play against some good teams in Japan, China and Russia” Brickler said. “It was a very good league and it got a little scary towards the end of my time with the political stuff going on. “The election of Donald Trump as US President and having two leaders causing a lot of uncertainty make me think it was the right time to move to a team like Dundee. LeFebvre said: “I did my research on him and we got speaking. From then, everything fell into place and we got the deal done pretty quickly. “The one thing I noticed about him is his enthusiasm and speaking to other coaches about him, he’ll bring the speed that we’re perhaps going to miss from last season. “The Asian League is a good set up with players there from the NHL and KHL so for him to go straight there from college shows quality and I think he’ll be a good player for us.